Ask fellow campers about "Beaver Run RV Park" and nearby attractions. Rate based on weekly stay, site fairly level and long enough, wifi worked well, cable not bad, some fuzzy channels. All hookups worked well. Pull through sites surrounded by pine trees. laundry did not look good, 2 old washers, 2 dryers , 1 was not working. went into town to do ours. mostly quiet even though close to I-16.. Camp workers very friendly and helpful. We camped at Beaver Run RV Park in a Travel Trailer. Stopped here twice. Once in November and once in April. Nice clean park in the pine trees. Long pull throughs. Shower very nice and clean. They were very nice in the office. Free hot cookies. 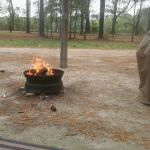 We camped at Beaver Run RV Park in a Motorhome. Easy access into park. Guided us to our site, helped us in. Some residents in the park but no problem. Brought us warm chocolate chip cookies. Site was a little muddy with the rain. Had to walk a bit to the bathhouse. Would stay again. We camped at Beaver Run RV Park in a Motorhome. Thank you for camping at Beaver Run RV Park. I am glad that you were welcomed with a guide and cookies. We do our best to make each guest feel safe and comfortable. We do offer a Good Sam discount and we honor active duty military with a discount. I am sorry that you had to walk a bit to the bathroom. Most of our sites are very near to the bathroom. I hope that you have a good trip and until we meet again. Very nice private campground; nice playground, rec room, showers/bathrooms were clean. WiFi worked great, cable & sewer at each site. We camped at Beaver Run RV Park in a Travel Trailer. Great restaurant/truck stop at the interstate exit called Grady's. Good homemade food. I am so glad that you took the time to write a review of your stay at Beaver Run RV Park. We work hard to keep our bathrooms ready for our guests to use comfortably. The children seem to love playing on the playground at the end of a long travel day. Thank you for choosing to camp at this family friendly campground. Hope to see you next time. Warmly greeted and given chocolate chip cookies, escorted to site that was 90 feet long . Great hookups, level site , cable tv. We camped at Beaver Run RV Park in a Motorhome. Easy on off Interstate 16 exit 111 . Diesel available at truck stop on same exit. Chocolate chip cookies, a smile, and peaceful camping in the pines... what else do you need? Thank you for camping with us. I am glad that you found the site plenty long enough. Come see us again when you travel by Metter, GA.
Super park for the area, very good value (weekly rate w/goodsam discount applied to that!) 50amp FHU Pull through. Nice owners, employees & residents. Scenic pond, nice shade [tall trees, well trimmed], peaceful surroundings, cookies for the dog in the office, FRESH BAKED CINNAMON ROLLS & bread available for order, Farm Fresh Eggs available for purchase. Some sites too shaded for satellite to work (they supply cable, 24 channels). Level sites, plenty big enough for big rigs plus toads. I would have rated it a 10 *for this area*, _for the cost_, but sand lots & sugar ants (not really their fault) plagued us a bit. We camped at Beaver Run RV Park in a Motorhome. Thank you for taking the time to comment on your camping trip. We try to be fair in price and service. I am glad that we met your expectations. We like to please our guests and their dogs too. Sorry that you met some of the GA local life -ants. We do everything we can to discourage them, and yet... sometimes they still drop in for a visit - although that visit is usually short lived as we chase them out again. I am glad you enjoyed some of the perks - fresh bread, rolls, cookies, eggs, and doggie treats. Hope to see you again. We stayed for just an overnight and it was very convenient. Family run and very friendly. Spacious pull through large enough for the motorhome and toad so we didn't have to unhook. Many trees for shade. Not really a destination but they did have a few amenities that we did not use. We would stay here again! We camped at Beaver Run RV Park in a Motorhome. I am so glad that you were able to camp for a night at Beaver Run RV Park. We try to help each camper enjoy a peaceful night in the pines. We are convenient for travelers. We hope to serve you again on your next travel stay. We arrived after hours but the young couple managing the campground were friendly and very accommodating. It was a convenient halfway stop when driving from Augusta to Tybee. We didn't experience much in the way of amenities but we would camp here again. We camped at Beaver Run RV Park in a Motorhome. I am glad that you found Beaver Run RV Park along the way. There is something great about a peaceful night's sleep. We appreciate your stopping to camp and look forward to seeing you again as you next pass this way. Hopefully, next time, you will have more time to enjoy swimming, boating, and our recreation room. We stopped here for a quick overnight. This is a decent park, close to the interstate but reasonably quiet. I was most impressed with the size of the sites. Ours was long enough to accommodate two of the longest rigs imaginable. Restrooms are clean and adequate. There's a small truck stop/convenience store on the way in so fuel is very available. We camped at Beaver Run RV Park in a Fifth Wheel. I am glad that you found Beaver Run RV Park on your travels. We are conveniently located between Atlanta and Savannah/Hilton Head and Florida and the Mountains. You are right, our sites are big enough for the biggest rigs. I hope that you enjoy the rest of your travels and we welcome you back if you pass this way. Pet friendly with a dog yard and water to let them run....very quaint and noise from 16 not bad at all there are so many trees and farms! Adequate sites but all under big pines- wifi to pretty good! Very family and friendly owned so ould com back hen travling GA for a fe nights! We camped at Beaver Run RV Park in a Motorhome. We love our guests and our guests love their pets. The fenced in off-leash area has been a hit with both. The rural, southern feel surrounding Beaver Run RV park adds to the peaceful camping. We do offer some sites that are in the open for those who prefer to camp without pines overhead. Happy travels to you. We have a spot for you should you travel this way again. This is my third time staying at this campground in the last 4 years. I have always found the grounds and bathhouse to be very clean and well kept. The pull thru sites are long and level allowing me to remain hitched for my 1 night stay. We camped at Beaver Run RV Park in a Fifth Wheel. I am so glad that you continue to camp at Beaver run RV Park. We strive to keep everything clean so that people can relax and enjoy. Thanks for camping, see you next time. Stayed 1 night. Nice hosts. Place is about 1/4 mile off I-16. A little road noise if outside your RV. You will likely track sand into your RV. Long pull thru sites and utilities worked well. Fenced dog run is too far from sites to be conveniently used. Interior roads were easy to navigate. Would stay again if in the area. We camped at Beaver Run RV Park in a Fifth Wheel. Don't eat at Papa Buck's BBQ in Metter. Mediocre food, mediocre service, and their exterminator is also mediocre...or non-existent. Thank you for camping with us. I am glad that you appreciated our Big Rig friendly sites and that you found it easy to get around the park. Thanks for the suggestion about the dog walk area. We will consider how to make the dog off leash area more convenient for the sites that are farther away. Praise God, we've just gotten some rain after the long dry spell, so hopefully that will make for less tracking. Hope to see you again next time you pass this way. How could you not love this place? Just as we were finishing setting up, they deliver some warm, home-made chocolate chip cookies! The spots were quite long and comfortably wide, but not very private. Most sites are nestled among a pine forest. The other campers there were very friendly. We camped at Beaver Run RV Park in a Motorhome. I am so glad that you enjoyed you camping stay in our peaceful park. It is our pleasure to offer fresh baked, homemade with love cookies to welcome our guests. There is just something peaceful about sleeping in a pine forest. Our long sites are cut at an angle so that you are never directly across from your neighbor's window. See you next time. Closed on Sunday's. No propane service on Sunday's even though they advertise it on the road. Work campers openly complain about providing customer service. The owners are friendly though. Short term would be ok. I don't recommend long term. We camped at Beaver Run RV Park in a Travel Trailer. Thank you for camping with us. I am glad that you appreciated our clean bathrooms. I am sorry that we were not able to help you on Sunday. We are a family business, and we are at church on Sundays. However, we are always just a phone call away to take care of any urgent needs of our guests. Our staff is usually so eager to help our guests that they usually get glowing reports from campers. I am sorry that you did not see that side of them. We wish you well as you camp onward. Park is located 1/2 mile south of I-16 @ exit 111. We were not bothered by road noise. Sites are located among tall pine trees & most are pull-thrus. Sites are long enough to stay hooked up for a one night stay. Utilities are located toward rear of sites. Roads & sites are packed sand/gravel. Park has a fishing pond, frisbee golf, & a nice childrens playground. Wifi & 24 channel cable tv both worked well. In addition to chocolate chip cookies on arrival, you can order some very tasty homemade cinnamon rolls in the office. We found the staff to be very friendly & helpful. We would definitely stay again when in this area. We camped at Beaver Run RV Park in a Fifth Wheel. Thank you for taking the time to comment on your stay at Beaver Run RV Park. I am glad that you found our large, level sites convenient for pulling in and staying connected. We strive to welcome travelers with a peaceful night camping AND fresh baked cookies! Thank you for noticing the playground, the frisbee golf. We hope that people can relax and enjoy a family fun time. We work hard to provide the channels that our guests want to see and an internet connection to make connecting with friends and family easy. I am glad you enjoyed some fresh baked goods too. We hope to see you again if you pass our way. We ate at Bevricks Buffet and it was very good southern cooking. Only passed thru this area. Antiques shop in town, but other then that not much to do. right off I-16 and easy in and out. cheapest propane for RV, so we filled up. Are you affiliated with Beaver Run RV Park ?